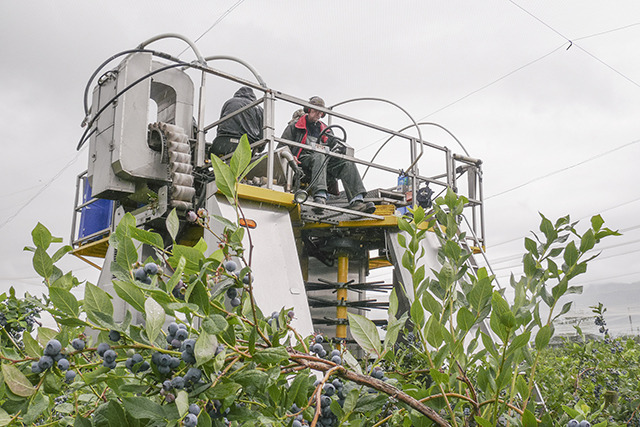 A mechanical harvester navigates beneath the protective netting at Jason Smith's Abbotsford blueberry farm. Smith says the netting is no longer practical because of rising costs and declining berry prices. 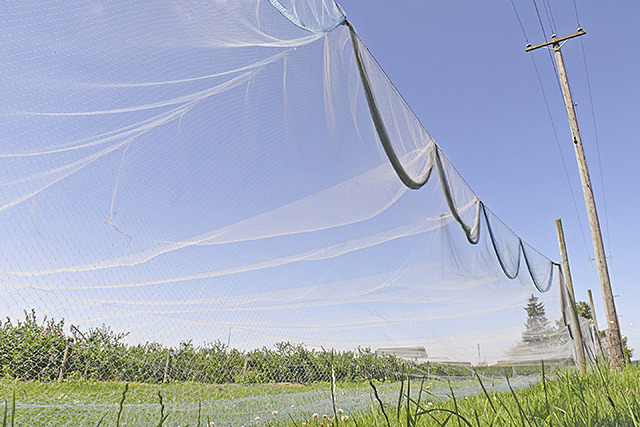 This could be the last season Jason Smith uses netting to protect his Abbotsford blueberry crop. Smith started hanging the nets over his Sim Road farm in Matsqui Prairie in 1998, following the lead of his father, Harvey Smith, who put up nets after losing almost all of his berry crop to starlings a few years earlier. The nets were pricier than propane cannon scare devices, but once up, there was no need for further maintenance. But now, with berry prices going down and expenses up, Smith doubts he can continue the practice. “That’s probably something (netting) that we’re not going to be able to do,” Smith told The News Monday. Smith, who just stepped down as chair of the B.C. 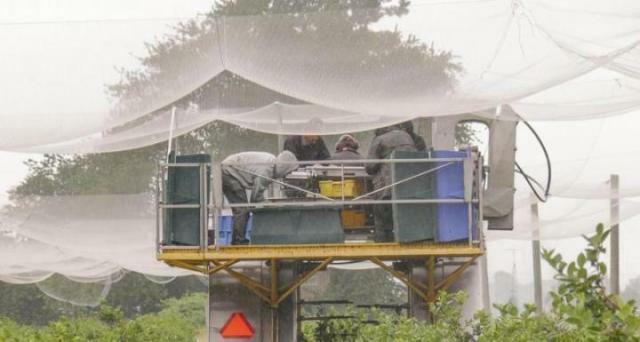 Blueberry Council, estimates there are no more than eight blueberry farms still using netting among the 800 blueberry growers who belong to the umbrella group that speaks for the industry. “It (netting) is really expensive,” Smith said. Among other things, the dozens of telephone-line-sized wooden poles the netting is strung from have gone from costing $125 each to $300, Smith said. There is also a higher labour cost of having people put the netting up and taking it down each season, adding about $800 an acre in costs, Smith estimated. If he wants to keep birds at bay without netting, Smith says his most likely alternative is audible bird scare devices – the propane cannons that have generated a flood of complaints from Abbotsford residents who object to the loud explosions the cannons emit to startle birds. Other approaches might involve drones, or “kids on motorcycles” shooing the birds away, Smith said. A few farms away from Smith, Wayne and Colleen Sandberg are also considering alternatives to the nets at their Page Road farm. The Sandbergs estimate it cost them $80,000 to set up the system of poles and wire-supported netting, and $15,000 annually in labour and maintenance to put the netting up and take it down. To make enough to cover the extra cost of using netting, prices need to be above a dollar a pound, and at present, blueberries are selling as low as 65 cents per pound. After more than 10 years, the gear they use is nearing the end of its useful life, and carrying on would require, among other things, replacing 94 wooden poles at $300 each. If they stop using nets, the Sandbergs would prefer not to use noisemakers. Wayne is also reluctant to switch to propane cannons, but he doesn’t criticize his neighbours, who use the devices to keep birds off their blueberry crops. “They don’t bother me. I know these guys are just trying to farm,” he says. If the Sandbergs don’t use nets and they want to avoid noisemakers, the options are limited. Among them are drones, which can only remain airborne for short periods and are subject to increasingly complicated aviation regulations. Another possibility is using bright laser light to startle birds, but is something that could also could pose a potential hazard to aircraft, Wayne noted. Both the Sandbergs and Smith say that in Abbotsford, where hungry starlings are many, doing nothing is not a choice. They have seen the birds ravage acres of berries. “The year before we put the netting up, we lost 60 per cent of our crop,” Colleen said. According to one estimate, 11,000 starlings use Abbotsford as a communal roost. The invasive species was introduced into North America in the 1800s from Europe and the population quickly grew to more than 200 million. Last month, Abbotsford city council approved enforcement of new regulations limiting the use of propane cannons on a farm. The bylaw allows audible bird scare devices to operate from 6:30 a.m. to 8 p.m or sunrise to sunset – whichever is less – with a break between noon and 3 p.m. Single-shot cannons can fire once every five minutes and multiple-shot devices can blast 11 times per hour for a maximum of 33 shots. Fines start at $200 for a first offence, $300 for a second, and rise to $500 for third and subsequent offences. There is also a $300 fine for failing to update bird management records.